Trenching - Outlander Contracting Ltd.
Any kind of trenching is a theoretically a hazardous worksite, because of the unpredictability of the materials. In addition to the risk of cave ins, workers in trench settings may also be exposed to lethal materials that have been uncovered, drowning because water fills the trench before the worker can getaway, and the chance of smothering when adequate oxygen cannot enter the soil, spill piles, or other materials. Every trenching task is unalike, so recognizing the particular risks at the worksite is critical. A qualified worker with specific training in trenching safety must inspect the site vigilantly and establish the condition of and obstacles linked with the soil that will be moved. The worksite analysis should also inspect whether there are utility lines or pipelines that may be in close to the dig site, the possible impact of underground storage reservoirs, overhead power lines near by, if traffic on nearby roads might escalate causing the unpredictability of the adjacent soil, and the chance that water from neighboring trenches or a sudden downpour could suddenly fill the trench. 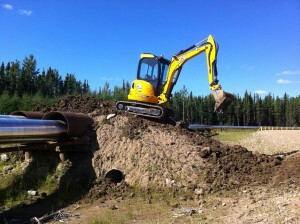 The precise location of services must be determined by hand digging or by hydro vac. First call locates are often imprecise, despite their best intentions. OH&S rules state that protective methods must be in place prior to excavation. That involves everything from planning how to handle traffic, to monitoring for vapors and gases caused by equipment in or close to the trench, to providing air circulation and any required respiratory protection. A specific worksite may need shoring supplies or trenching boxes to safeguard the workers. Safe access in and out of the trench is critical, mainly when a cave in, injury, or other crisis could exist. Workers need to be able to getaway quickly in the event of a cave in, water infiltration, or an encounter with harmful materials. These requirements pertain whenever the chance for entry by employees is present, even if for just a second. If the trench is 1.5M deep or more, OH&S regulations require proper access and egress for all workers every 8M, whether that includes ladders, stairs, or a ramp. That egress must be constructed by someone with ground disturbance training, and the reliability must be protected so that workings of the egress will not be removed in the event of an incident. The egress must also guarantee that workers will not be exposed to other injury risks when exiting the excavation. There are extra hazards considering structural reliability for access and egress of vehicles entering and exiting the excavation also, so inclines used by them must be devised by a qualified employee or contractor in structural design. The rescue plan must include an all-inclusive plan that points out how workers must respond in a mixture of circumstances. For example, the procedure that would be place for a cave in will be a little altered from one that is needed if a worker experiences a heart attack while in the trench. It is imperative that workers comprehend the rescue plan, because the incorrect response can worsen a difficult condition. A worker hurrying in to free a stuck co worker may result in both of them becoming trapped. The rescue plan must also designate a worker or workers who will contact the fire department and other external rescue persons that respond to an incident. It’s easy to consider a pile of excavated material as nothing other than a mound of soil, but the heaviness and fluidity of a spill pile can form its own set of dangers. 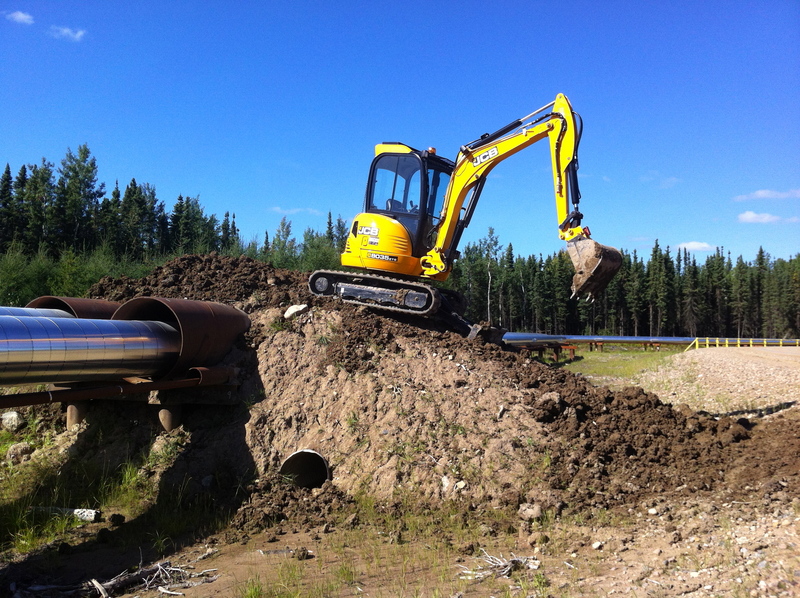 Spill piles must be located far enough from the trenches so that they do not tumble back into the trench, cause the edges to cave in, or create a condition in which equipment can slide into the trench. Normally, spoil piles must be kept at least 1 meter from the , and retaining methods must be used to keep spills from dropping in. If there is not sufficient room to store materials safely at the worksite, they should be trucked to a temporary site elsewhere. An excavation worksite is not stationary. Each time a load of dirt is removed or a piece of heavy equipment travels near the excavation, it altars the integrity of the worksite. That is why it’s essential to inspect the worksite at the start of each shift, or any time an action multiplies the hazard to workers. The worksite must also be inspected throughout and after rain falls, or when freezing weather generates slip and fall hazards. Merely having a laborer gaze around is not sufficient. The person who is examining the worksite must have training in ground disturbance, both soil analysis and the correct use of protective systems and policies, and those excavations 6 meters deep or more need protective systems designed by an authorized engineer. All operators are competent and have relevant tickets. We communicate with other contractors to have the project completed on budget and in a timely manner.